Light Years is the latest cut from their upcoming fifth album, ‘I Am Easy To Find’, and follows on from March's lead single You Had Your Soul With You. The LP will arrive on May 17 via 4AD, following 2017’s chart-topping ‘Sleep Well Beast’, and will be accompanied by a short film of the same name by Mike Mills. The new song, which the band have been playing at live shows for a year, relies heavily on a beautifully soft piano melody, contrasting with the deep, intense vocals of frontman Matt Berninger. Its accompanying video consists of clips from the film, and sees Oscar-winning actress Alicia Vikander float through her monochrome life in time to the music. The National embark on a world tour this year, starting in London on April 18 and continuing through the UK, before heading to North America and Europe. 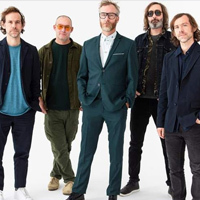 Click here to compare & buy The National Tickets at Stereoboard.com. The National have confirmed their new album. The National will play a headline London date this spring. The National have announced a CD and digital release for ‘Boxer Live in Brussels’.